Make your '10-Current Ford Mustang stand out from the rest with this great-looking Graphics kit. This easy-to-install kit is packaged as a set of three (3) PRECUT pieces, ready to install in a wide variety of colors - NO TRIMMING required! Shinoda inspired graphic kit consists of prefitted and contoured pieces as shown in the illustration. 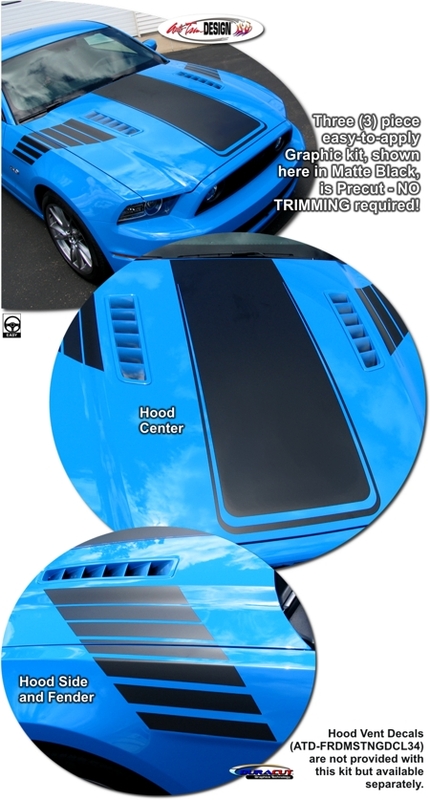 This kit is specifically made for the '10-Current Ford Mustang V6, GT, and 5.0 factory hood and fender areas as noted in the Graphic Application Chart and will not fit any other vehicle.